Originally from the Philadelphia area, Tegan M Brozyna (Roberts) is an artist based out of Brooklyn, NY. Tegan's work draws from her background in painting and sculpture as well as a long family tradition in textiles. Her intuitive work is inspired by materials, landscape, mapping and an insatiable curiosity with the world around her. Brozyna received a MFA from Brooklyn College where she was a Graduate Teaching Fellow, and a recipient of the Cerf Award in Art as well as the Dean's Award in Art. 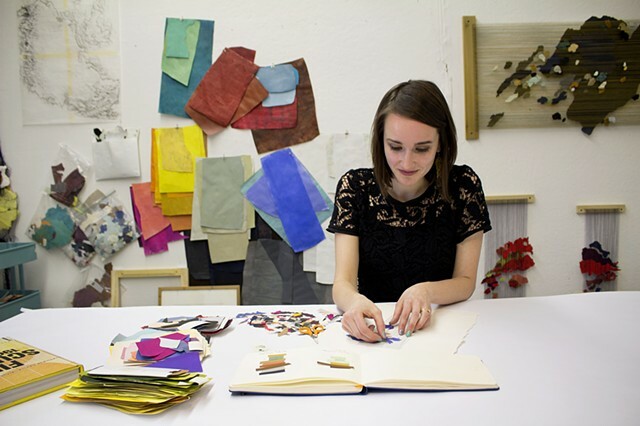 Tegan holds a BA in Painting and completed a Post- Baccalaureate Fellowship at New York Center for Art and Media Studies in Manhattan. Tegan has exhibited at Queens College, Porter Contemporary in New York, Trestle Gallery in Brooklyn, Invisible Dog Art Center in Brooklyn, Long Beach Island Foundation of the Arts & Sciences in Long Beach Township, NJ, the New York Public Library and Baum School of Art in Allentown, PA. Her work has been included in shows in Orvieto, Italy and Blonduos, Iceland where a piece was permanently installed at the Icelandic Textile Centre. From December 2014 - July 2015 three of Tegan's large-scale sculptural pieces were on view at the Philadelphia International Airport. In addition to teaching at Brooklyn College, Tegan has lectured at Messiah College in Mechanicsburg, PA and Hussian School of Art in Philadelphia. She is a former artist in residence at World Class Learning Academy in New York, Textile Arts Center (Work in Progress Program) in Manhattan and the Icelandic Textile Centre in Blonduos, Iceland.